Industry 4.0 is an industry ‘hot topic’. It is being discussed alongside the ‘Internet of Things’ (IOT) as the future for process equipment, allowing integration of a range of processes that facilitate and improve the sharing of data. Industry 4.0 is not a new concept. It originated in 2011 as a way of fusing the online world with the world of industrial production. Correctly implemented, Industry 4.0 it will drive future productivity growth for each company that invests in the technology. Communication between machines, devices, sensors and people – for example using the Internet of Things (IOT) or the manufacturing equivalent; ‘Industrial Internet of Things’ (IIOT). This technology enables devices to collect and exchange information. Visibility of data from a range of processes to provide accurate information for management, empowering intelligent productivity and innovation strategy. For example, information on Overall Equipment Effectiveness (OEE) made instantly available to decision makers. Firstly, the ability of assistance systems to support humans by aggregating and visualizing information comprehensively, for making informed decisions and solving urgent problems at short notice. Secondly, the ability to physically support humans by conducting a range of tasks that are unpleasant, exhausting, or unsafe for their human co-workers. The ability of industrial systems to make decisions on their own and to perform their tasks as autonomously as possible. Only in the case of exceptions, interferences, or conflicting goals, are tasks delegated to a higher level for human input. The principles of Industry 4.0 run parallel with concepts already in use by Universal for the strategic direction of the development of converting machinery. The concept of intelligent design working symbiotically with human operators together with the transparent flow of information, streamlining productivity and enhancing profitability has been core to the development of machinery at Universal for well over five years. Why use people to do tasks that are better done by machines? The IIOT requires devices to communicate with one another and exchange data. In order to effectively communicate with a wide variety of different devices, MQTT (Message Queue Telemetry Transport) becomes a standard communication protocol in IIOT. The Universal X6 and X6 VT slitting machines support MQTT. This communication protocol is a lightweight publish/subscribe messaging protocol for M2M (machine to machine) communications and is already being widely implemented in different application service such as Facebook messenger, and Amazon web service. Unlike traditional request-response polling protocols such as HTTP or Modbus, MQTT is based on the principle of publishing messages and subscribing to topics, where every HMI publishes messages to a MQTT server that functions as a broker. Every MATT message is also classified by one topic. In this manner, the MQTT broker is capable of reliably and precisely sending the message out to those clients who have previously subscribed to this topic. With the capability of communicating over 250 major manufacturers of PLC and controller, the Universal X6 efficiently integrates diverse data between different devices and effectively publishes needed data to the MQTT broker. OPC UA (Open Platform Communications Unified Architecture) is a communication technology often used in industrial automation fields. It simplifies communication between higher level devices such as a Universal X6 slitting machine and the customer’s Management Information System (MIS). OPC UA features cross-platform interoperability, unified access, standardized communication, and security. In this architecture, the Universal X6 with built-in OPC UA server plays a key role as Communication Gateway, and allows OPC UA clients to access HMI or PLC data by subscribing to tags to receive real-time updates. OPC UA can be used to transfer recipe or product data to the Universal X6 from a customer database with quality and productivity data being sent in the other direction. Structured Query Language (SQL) is a standard system for managing data held in relational databases. 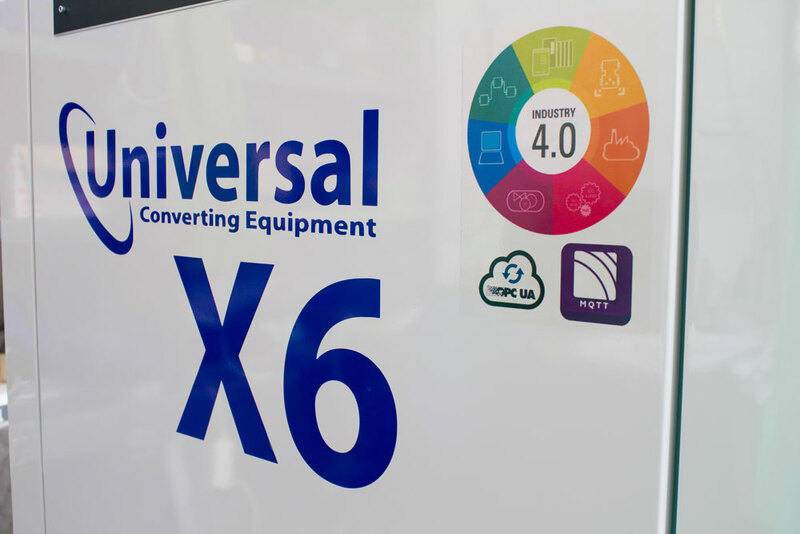 Equipped with easy-to-use database integration, the Universal X6 can send machine metrics, production data or recipes to a database system directly without any middleware system. This data can then be managed in a larger scale using batch database operations. Plus, the built-in database-related viewers enables smooth operations using data on the databases. These features can simplify your processing works and save your precious time. Collecting machine metrics is always a challenge for integration. In the past people used USB drives or FTP services to retrieve files (such as CSV files) from a machine, convert the file formats, and then save them to separate tables or spreadsheets. This cumbersome work can get compli­cated once more files or more machine metrics are added to the system. A better option is to save machine metrics directly to a database. This has several benefits includ­ing simpler batch operations, no more file conversion, more storage options, and spaces, and finally, use intuitive SQL commands to customize your read/write/modify/delete operations on the database. The Universal X6 built-in database integration can send real-time machine data, alarms and events to databases, and this data can also be displayed on HMIs or remotely (PC/mobile re­mote-control app). This can be done without writing any program code, an easy database solution. After saving the data into databases, IT/MIS experts can further analyze and make decisions based on those data, such as report generation, energy usage, manufacturing record tracking. The SQL Query feature provides a more general way to access databases. It can send and change recipes in a database like a shared Recipe Database when multiple machines use the same recipe. Batch recipe change can be applied to all machine at once using databases. SQL Query also accepts customized SQL commands for filtering and statis­tics, such as OEE calculation (Overall Equipment Effectiveness), unit production rate, averag­es of numbers, standard deviations, etc. The Universal X6 has extensive diagnostic systems translating data from all the devices on the machine into simple to use fault diagnostics. The Live electrical drawings show the status of all the inputs and outputs to the system for detailed diagnostics. Machine use data allows knife life to be measured and if required, the machine can indicate when knives should be changed. The Universal X6 uses a secure 128 bit SSL encryption mechanism, as commonly used for on-line banking, to ensure the reliability of its remote data transmission. When connected remotely, a Universal engineer can connect to all the drives and HMI’s on the machine for real time diagnostics. The same connection can be used to remotely view the machine operation on tablets, mobile phones and PC’s. As companies strive to improve the OEE of their processes, one option is to increase the level of automation. The Universal X6VT has a number of linked automation systems allowing the machine to set most of the parameters required for a job change. Automatic guider sensor positioning, automatic knife positioning (razor and rotary shear), automatic roll unloading and automatic core loading and positioning are standard. These minimise the time taken to change between one order and the next as well as minimising the stopped time between sets of rolls. As well as dramatic productivity gains, there are other benefits as well. Health and safety is improved as knife handling is reduced and repetitive tasks such as pushing cores onto differential shafts and locking in position are removed. Quality also improves as the knives and cores are always placed in the correct position. Universal Converting Equipment has been building slitting and rewinding machines for a long time. The thinking behind Industry 4.0 follows the development route already chosen by Universal. The four principles described at the start of this article are evident in a lot of the detail contained in the Universal X6 slitter range. In particular, the Universal X6VT has a comprehensive automation and communications package as standard.